Agoo Hostel v Accra, Ghana: Zarezervujte nyní! If remainder of payment is not paid 3 weeks prior to start of requested stay, then the booking will be cancelled and 50% of the balance due will be payable. Award-winning Agoo is located in the heart of Accra, with close and easy access to the city’s tourist sites, shopping, markets, nightlife, and other amenities. With 21 beds in total, we offer a range of colorful accommodation: attractive and spacious dormitories, which are perfect for the budget traveler and cozy, relaxing private bedrooms for holiday or business tourists. Shared bathrooms with hot showers are located around the accommodation for guest use. 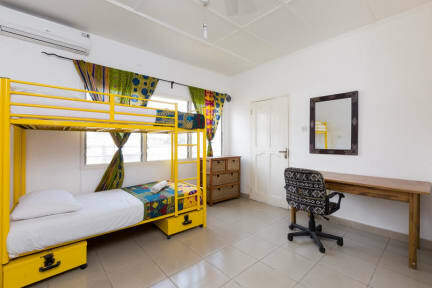 Each of our rooms comes with air conditioning, fresh linen (including a top sheet and towels), lockers and ceiling fans (in the dormitories). Agoo’s breakfast will set you up for the day and is included with every booking. We serve fresh, seasonal, tropical fruit salad, eggs together with home-baked bread and pastries every morning. Our Ghana-grown coffee is freshly ground and sourced locally. Delicious home cooked food is prepared by our wonderful chef with her menu available from lunchtime into the evening. For guests who would like to prepare their own food, we offer access to our well-equipped kitchen! We have large communal areas that make great places to chill and meet other guests and travelers. For global nomads, you can continue to work - enjoy Wi-Fi access throughout the hostel, and use our printing and scanning facilities. If all else fails, just kick back and enjoy our tranquil, tropical garden from our bar area or summer-hut balcony space. Agoo staff members are welcoming and friendly. They love to help you out with any arrangements or information that you need. We offer tours both around Accra and further afield. We are situated just off Central Ring Road where guests can take local buses (trotros) and taxis. The central station, Nkrumah Circle is only 10 minutes away with access to every part of the city and country. 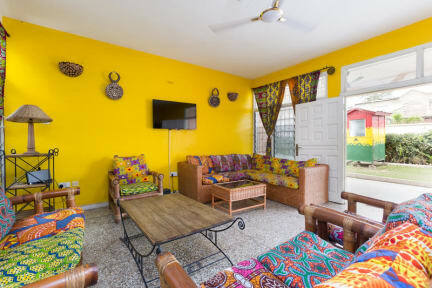 The airport is about 6km distance from Agoo and we are also a short ride from popular Osu/Oxford Street, where you can find the best nightlife and shopping in Accra. The property itself is very secure. We are based a stone’s throw from the President’s house with a police patrol in the area. There is also night security on the property.